Born in Belgrave in 1865, William Arthur Evans was the elder son of William Evans (1830 – 1921), originally of Chadlington, Oxfordshire, who by 1851 had moved to Leicestershire and taken over the long-established Belgrave Corn Mill jointly with his elder brother Arthur. The two brothers expanded the business and eventually built a major new steam-powered corn mill, and were joined in the business by William’s sons, William Arthur and Edward Dare Evans (born 1875; died of war wounds in Alexandria in 1915). In 1905 William Arthur married in Leicester Annie Goddard (1882 – 1974), third daughter of Joseph W. Goddard, manufacturing chemist, later Sir Joseph Goddard, whose Leicester-based silver plate cleaning and polishing products were to achieved worldwide fame. His uncle, Arthur Evans, moved to Birmingham, and in 1898 the original partnership was dissolved, and William’s two sons gradually took charge of the corn milling business, with William Arthur Evans taking over the management almost completely by the time his younger brother joined the army in 1914. By this time William Arthur had become established in a totally different area of business. In 1902, an American-Spanish inventor, Hidalgo Moya, arrived in Leicester, carrying his handmade model of what, at the time, he considered a revolutionary design of typewriter. A local businessman, J.G. Chattaway, was persuaded to finance the opening of a small factory in Garton Street, Leicester, where The Moya Typewriter Company could develop, manufacture and market their new machine, with the aim of producing a workable typewriter that would sell for five guineas. This he achieved but the machine was uneconomical to produce and not very successful. An improved second model was also unsuccessful. By 1908 Moya needed more financial assistance for the company to survive, let alone develop, and at this point William Arthur Evans saw the potential of Moya’s struggling business and particularly of Moya’s third, much improved, design, and invested his own money in establishing a new company with Moya, the Imperial Typewriter Co. Ltd., with Evans as its Chairman, a position he was to hold until his retirement in 1933. The new third design, marketed as the Imperial Model A, was an outstanding success and provided a sound foundation for over sixty years as one of the world’s leading typewriter manufacturers, centred on a very large and well-designed new factory in East Park Road, Leicester. 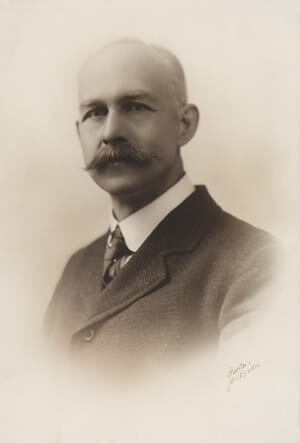 A member of the Lit and Phil since 1902, in 1914 he succeeded his step-mother, Agnes Archer Evans, as President. His inaugural address as President was given just two months into World War I, and he used the opportunity to address in some detail the risks of the War in relation to food supply, arguing that this would depend on continuing to allow “natural economic laws” to continue to have full play, and that it was vital to ensure that the vitally necessary flow of imports of grain and other food should be maintained, so “our command of the seas should not be imperilled.” Rather than wait until publication in the Transactions was possible, his Presidential Address was quickly published at his own expense and widely circulated. In around 1913 Evans and his wife, Annie Evans, moved into “Inglewood” the already famous Ernest Gimson house on Ratcliffe Road, Leicester, initially on a lease from the Gimson family, and lived there for the rest of their lives. Subsequently they bought the freehold of “Inglewood”, and in 1930 they built a substantial two bay extension to the house in a very sympathetic style, designed by the architect William Keay (President of the Lit and Phil for 1927-28). Evans was very active in many others areas of Leicester life, including serving as a Magistrate, and he was President of the Rotary Club of Leicester for 1924-25. His son, Roger Martin Evans (1907 – 1967) was to follow him as President of both the Lit and Phil (1962-63) and of the Rotary Club (1964-65). Though several families have over the years supplied two Lit and Phil Presidents, the Evans family is unique in providing three of the Society’s Presidents. Sources include: Memorial Testimonial Volume on retirement as Chairman of Imperial Typewriter Co. Ltd. 1933. (Record Office for Leicestershire, Leicester and Rutland), and Registration and Census Records.